Courtesy of Robbie Hudson of The Wild Swimming Brothers. Robbie Hudson of The Wild Swimming Brothers explains his artwork. 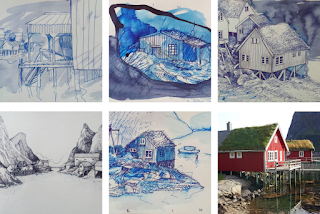 "In my portfolio you'll find sketches and paintings inspired by various swims in far-flung places, from the lakes of the Atlas Mountains to Australian billabongs. One of my first wild swimming exhibitions was inspired by somewhere a little closer to home. It all started with Lake Ullswater, one of my favourite lakes in Cumbria. Ever since I was young I have been swimming in its waters and I always wondered if I would be able to swim it from end to end. With an artist bursary award from VARC (Visual Arts in Rural Communities) I finally completed this ambition. Then I created a series of artworks to describe the experience. In this series I experimented with creating symbols that referenced the various parts of the landscape, as well as my physical and psychological training. My practice uses different forms and concepts of journeys to structure and inspire the artworks of each series. Each project varies from endurance swims, treks and runs through the the Atlas Mountains, Indian Himalayas, Australian Outback and the Scottish Highlands, to name but a few. I trace a line through a landscape and follow that course, experiencing a place physically, mentally and emotionally before I try to map it artistically. I believe that in order to see and represent a subject in a unique visual way, you must first earn a new perspective from which to look from. I enjoy exploring the link between extreme physical exercise and creativity. Literature, writing, land art and travel are important influences in my life and work. I am also passionate about rewilding processes, and the protection and preservation of the natural world and the animal kingdom." His artwork has been exhibited in Berlin, London, Newcastle, Kendal, Istanbul and Toronto, and is featured in private collections throughout Europe, the United States and Australia. Sketches of Reine Harbour in the Norwegian Lofoten Islands are above. To see more of his artwork, visit here.